Beer adds a lightness and silkiness to cocktails without watering them down. Last Monday at Revival Bar & Kitchen in downtown Berkeley, Ashley Routson geared up, as she often does, for a battery of questions. "So," said the woman at the bar, pausing a beat. "What's a beer cocktail?" "Oh, it's just a cocktail with beer in it," Routson replied, sunnily. This was a charity event for the food-education nonprofit Sprouts Cooking Club, and the woman's attitude was less interrogative than interested, genuinely mind-blown at the concept of a beer cocktail. "So, like, you mix beer into the cocktail?" That's exactly what you do. Or, more accurately, you top the cocktail off with it, or shake or stir the beer in. Sometimes, you even distill the beer down into a syrup or tincture, and use that in the place of bitters. "So ... with another liquor?" And so it went. At this point, Routson is used to it: Though, in the past year or so, beer cocktails have gone from anomaly to novelty, they're still far from commonplace, at least in most circles. That might change soon, though, as a new breed of mixologists — led, largely, by Routson, who works at Berkeley's Bison Brewing by day and who also runs BeerMixology.com, a resource for like-minded brewers and bartenders — begins to turn their customers and each other onto the benefits of using beer as a component in cocktails. 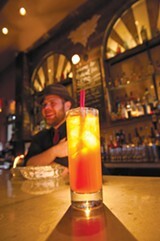 "It's definitely a growing thing," said Nat Harry, Revival's bar manager and a contributor to BeerMixology. All Revival's beer cocktails have gone over pretty well, February's SF Beer Week hosted a number of well-attended beer cocktail events, and BeerMixology's traction is slowly increasing. Morgan Schick — who, along with Eric Quilty, runs the avant-mixology popup Jupiter Olympus — said he's even started hearing requests for beer cocktails at bars. According to Andie Ferman of St. George's Spirits, which has partnered with Bison and Revival for various beer cocktail-related events, the Bay Area is particularly ripe for the trend. "The craft beer industry is exploding right now, and that's coinciding with this mixology boom," she said — and that means a new generation of innovation-minded brewers and bartenders, a fresh excitement around making and drinking creative cocktails, and a brewing community that's sophisticated enough to provide more detailed tasting notes about its products than ever before. 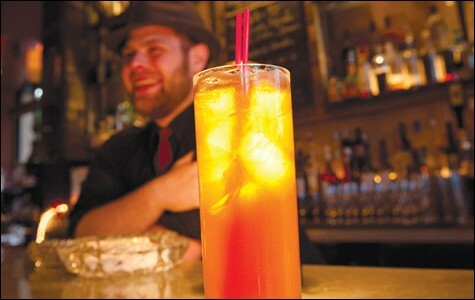 For people like Routson and Harry, using beer in cocktails is something of a no-brainer: Because it's carbonated, it adds lightness and silkiness without watering the drink down (thereby making it pretty much the ideal summer mixer), but it's also got a denser mouthfeel than juice or club soda. It comes in a wide range of flavors — from the most robust stout or double IPA to the lightest, tartest German wheat beer and innumerable varieties in between — and these days, especially in California, brewers are adding all kinds of unconventional herbs and flavorings to beer, making the options pretty much infinite. Essentially, Harry said, "beer adds another layer, another dimension." But the problem with a layered flavor profile and endless flavor options is that it's also easy to screw it up. "Beer is so complex that it can be daunting," Routson said. It can be overwhelmingly sour or bitter, said Harry, and according to Schick, a little bit goes a long way. "It has a a tendency to take over a cocktail, so that's something you need to work hard to avoid." It can be difficult to find a mix that'll complement all of a beer's flavor notes and aftertastes, Routson explained, "and it doesn't always play nice in a shaker." Essentially, the problem with beer cocktails seems to be the fact that, in Routson's words, "there is no standard about what works and what doesn't." In other words, beer challenges common mixological tenets in a way that can scare off even the most experienced bartender: Schick, who's been in the business for several years, said it took him a lot of trial and error to figure out how to do beer cocktails right, and even Harry admitted that she's had her fair share of colossal failures, of drinks that "sounded good in theory, but just ended up tasting sour or spoiled." What's more, beer cocktails are polarizing even among the very people you might expect to be behind them: "A lot of people in the beer community are skeptical of beer cocktails," said Routson. "The brewer intends it to be consumed as it's packaged, and when you do something different, it's like you're bastardizing this perfect product." Which is understandable, but maybe a little shortsighted. And Daniel Del Grande, Bison's owner and brewer, for one, doesn't look at it that way. "The way we see it is, we're building the audience for craft beer. It makes it more approachable for people who don't like beer — or think they don't like beer — and it opens up a new market for us." Same goes for the other end of the equation, according to Ferman of St. George's. "It's a very polarizing thing within the spirits community," she said. "But I'm having so much fun experimenting with ways to pair our spirits with beers. You have to go beyond what you think you like." Besides, Schick pointed out, beer cocktails, broadly defined, aren't actually all that new an invention: The Boilermaker or some variation thereof — basically, a shot of whiskey dropped into a can of cheap beer — has long been a favorite at blue-collar dive bars and college-town happy hours; the ale flip (an ale- and egg-based cocktail) was popular pre-Prohibition; and Schick has even read about people mixing beer and liquor and heating the combination with a hot poker way back in the day. At the same time, wine has long been a crucial part of cocktails like the Bellini, the French 75, and, of course, sangria, and, Routson said, "with the trend toward barrel-aged beers now" — that is, beers aged in casks that have previously held liquor, often whiskey — "it's like, what's so different between putting beer in a bourbon barrel and imparting the flavor that way, and mixing the two together in a cocktail?" Routson acknowledges that it may be awhile before beer cocktails end up on every bar menu in the country, but for now, she's hopeful and happy in her role as accidental evangelist. And though beer cocktails can be tricky and require some trial-and-error, both she and Harry promise it doesn't take a master-level mixologist to figure out which flavors are likely to go well together. Chocolatey, malty beers like stouts match up well with bourbons, which tend to contain sweet notes like caramel, molasses, and vanilla. Belgians and gin usually play well together, given that they contain similar floral esters. IPA, tequila or mezcal, and some kind of citrus is a common combination. (According to Routson, the only liquor that doesn't mix well with beer is vodka, which is flavorless and therefore tends to thin out the cocktail). In addition to shaking or stirring beer in normally, Routson also likes making beer-reduction syrups and using them in the place of bitters, and she's also been known to steep hops in a neutral spirit and use that infused liquor in drinks. At the Sprouts event, she made what was essentially a beery twist on a gin fizz: Bison honey-basil beer, St. George's Botanivore gin, fresh basil, lemon juice, honey, and a little bit of egg white; Schick, meanwhile, recently debuted a cocktail that combines rum, ginger liqueur, a whole egg, Anchor Steam liberty ale, and a dusting of nutmeg. Around the holidays, Harry did a flip that included gingerbread stout, Sailor Jerry run, an egg, and spices; right now, she's experimenting with a mixture of clementine purée, Breaking and Entering bourbon, Qi White (a tea liqueur), a little bit of lemon juice, and, to top it off, maybe an inch or so of IPA. Harry calls it the Oh My Darlin', a reference to the clementine, and it might just be the perfect summer cocktail: fruity and refreshing but not insubstantial, the beer adding a kind of weight and subtle flavor to the whole thing that's hard to notice unless you're looking and even harder to put a finger on, but somehow feels indispensable to the drink. You know, just like any other high-quality mixer in a well-made cocktail. Vigorously shake gin, lemon juice, syrup, and egg whites with ice. Pour over cracked ice, top with the beer.